Turn those leftovers into a Mexican fiesta... in your mouth. Microwave 1/2 cup or so of the leftover Low Country Pilau on HIGH for 30 seconds or until hot. 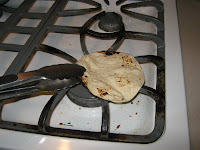 Heat 2 corn tortillas over gas stove-eye flame using a pair of long tongs until a little charred on both sides. Fill tortillas with chix/rice mixture and squeeze with fresh lime juice. Top with Becca's Quad-Side Guacamole, and if desired, salsa, shredded cabbage, and cilantro leaves. Makes enough to serve me. Adjust to fit your needs. Do you need other ideas on how to reinvent leftovers?